While insisting that the War on Women is a myth cooked up by Democrats, Teapublicans nationwide continue to propose and pass anti-women legislation. The latest salvo in the War on Women came Friday when Arizona Governor Jan Brewer signed a bill denying funds for non-abortion services provided to poor women by Planned Parenthood. Planned Parenthood Arizona claims a funding ban would interrupt its preventive health care and family planning services for nearly 20,000 women served by the organization’s clinics. The organization says it will consider a legal challenge. 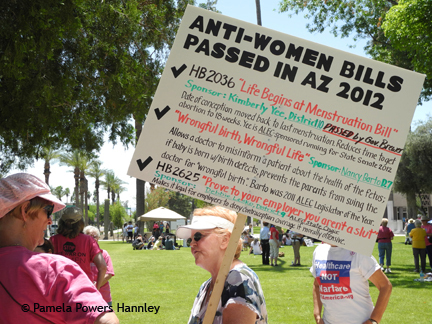 The measure targeting funding for Planned Parenthood for non-abortion services was one of several approved by Arizona’s Republican-led Legislature related to contentious reproductive health care issues this session. To express their extreme displeasure– putting it politely here– women nationwide demonstrated against the War on Women last Saturday. Approximately 200-300 women participated in the Phoenix event, held on the lawn of the state capitol. Originally posted on Blog for Arizona on May 5, 2012. 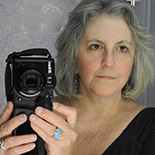 This entry was posted on May 5, 2012 by Pamela Powers Hannley in Arizona, Arizona Legislature, Choice, democracy, Free Speech, healthcare, Healthcare Reform, Jan Brewer, organizing, Politics, Republican Party, Tea Party, Video, War on Women and tagged abortion, Arizona, choice, Jan Brewer, Planned Parenthood, War on Women.